To come to terms with the deeper meaning of your life, the greater purpose of your life, there must be a deep evaluation, and this evaluation will be ongoing. It is fundamentally an evaluation regarding relationships. But I use the word relationship here in a more complete sense, for everything that you are associated with represents a relationship—your possessions, your home, your employment, the world itself, the change that is occurring within the world, the nation in which you live and many other things as well. They all represent relationship. People often do not think of things in the context of relationships, so this is perhaps a new way of looking at the world around you. Its value is that it gives you a very clear discernment, for what works in relationships in one arena can translate into other areas as well. If you have a harmful relationship with your work, for example, it will generate many of the same difficulties and impedance in your life as a difficult relationship with a person. If you have a difficult relationship with your home, it will hold you back. It will limit your possibilities. You even have a relationship with the future. This is true because you are sent into the world to serve the world as it undergoes the beginning period of great change. You have a relationship with the future. You have a relationship with the past, or with your evaluation of the past, to be more precise. The condition of your life, then, as a whole represents the condition of all these relationships. And you have no neutral relationships, for every one of them is either helping you or hindering you and holding you back. You are either gaining strength or losing strength in every one of these relationships. Certainly, some are more important and potent than others, but they all have a bearing on your life. So the deep evaluation is really an evaluation of what you are giving your life to and what you are assigning in life to be your chief influences, for every relationship represents an influence. The power of influence is very significant, but most people are not aware of this or its consequences. Certainly, you can recognize that the person you are married to would have a great influence over you, perhaps the chief influence in your life. But people rarely think, in terms of marriage or partnership, that the other person would become the chief influence in their lives. If this criterion were added to the evaluation of the other person in their relationship and the possibilities for union and partnership with another person, perhaps you would have a very different outcome than what you see in the world today. So think for a moment in terms of everything being a relationship. You have a relationship with people, places, things, events, the past, the future, world events and your nation. You even have a relationship with the Greater Community of intelligent life in the Universe, though it is unlikely that you have discovered what this means to you yet and how important it will be for your future. The next thing to consider is that each of these relationships represents an influence. Each influences you, and you influence them. You have power in the world in this regard, and the world has power over you. The power moves in both directions. And this power gives you the power of decision, which can be applied to more circumstances than you are yet aware of. This power of decision is fundamental to your success and to your future in a world that will be impacted by the Great Waves of change—by environmental destruction, by the decline of your fundamental resources, by a change in the world’s climate, by ever-increasing economic and political instability and the great risk of war and conflict that this will produce. The decisions that are important are the ones you make now, for there is time to prepare for the Great Waves of change. But time is of the essence. You do not have a great deal of time, for already the Great Waves of change are affecting the world. Yet here you stand with all of your relationships and all of their influences upon you. The great evaluation begins with taking stock of where you are now—how you spend your time, your energy, your focus and your interests. Where is your life being given away? What is it being focused upon? Where is it being assigned? You only have so much energy in the day, so much time in the day, so much space within your mind to consider things. Where is that all going now? What are you doing? Who are you with? What are your priorities? Where are you gaining energy in your life, and where are you losing it? And to whom are you losing it, and to what are you losing it? Where do you feel certainty, and where do you feel uncertain? What relationships are you in now that give you a sense of certainty and direction? And which relationships cloud that certainty or obstruct it completely? As you can see, there are many questions, and these are not all of them. That is why this deep evaluation takes time. It is not something you do in an hour as a process or an exercise. It is not something you spend a weekend thinking about. Instead, it is something you must give yourself to as one of the main priorities of your life, particularly at this time. This should be a major focus for you. For if you do not exercise your focus in this way, if you do not gain a greater discernment, you will not know what to do in the world today or tomorrow. And as the Great Waves of change come, your uncertainty and your vulnerability will increase significantly. Therefore, you must begin somewhere, and you must begin with where you are—not with what you want, or what you believe, or what you think will happen next, or your goals, or your ambitions or your dreams. Where are you right now? Who are you with, and what are you doing with them? What do you own, and is it giving you strength or taking strength away from you? What do you believe, and are your beliefs giving you clarity, or are they a replacement for Knowledge itself? Where is your time going? Where is your mind going? If you sit in meditation, what is concerning your mind? Where is your mind going? What problems is it solving? Obviously, this is a very big task and confusing as well because it requires you to become objective about your life. And objectivity here is of central importance. Do not be swayed by the thought that you must be loving as opposed to being fearful, for that is all preferential thinking. It does not represent clarity of mind or real certainty at all. Do not fall into the trap of the dichotomy between being loving versus being fearful. The objective here is to see clearly. The real dichotomy is whether you have wisdom or not, whether you are responsible or not, whether you are preparing for the future or not and whether you are seeing what is coming over the horizon of your life or not. Begin then with simple things. Review everything that you own. Everything that you own, even insignificant things, have a value to you of some kind and in a subtle way represent an influence. If your life is full of things that have no usefulness or purpose, then they are taking time and energy from you to a certain degree. You still own them, and so you are still in relationship with them. They are occupying space in your home and in your mind. Everything you own really either needs to be fundamentally practical and necessary or personally very meaningful, and that meaning must come in a way that supports who you are now and where you feel you are heading in life. You will find that your life is cluttered, that things are weighing you down and that there are a lot of old things in your life that perhaps you never think about. But, in reality, they are having an influence over you. As you let them go, you feel lighter and better, and somehow over time your mind becomes clearer. This is a good place to start. It is not very challenging, but it is a beginning step in developing discernment—discernment in relationships—for everything you do, everything you own, and everything you are associated with represents relationships. All of these relationships have an influence upon you—upon your awareness, your decisions and the direction that you know you must follow. Begin, then, to clear out your life, to simplify. You do not want to carry a lot of extra baggage into the future, for the future will be very uncertain in the face of the Great Waves of change. You want to be flexible, you want to be able to move easily, you do not want to be encumbered by lots of possessions. Here you must be very honest with yourself about what you own and what you do not own, what is meaningful and what is not meaningful. At the level of Knowledge, it is very clear. It is either a yes or a no. Or in some cases, there will be neutrality. But regarding things that you own, that you possess and that you are responsible for, generally you will find there will be a yes or a no within yourself. This will make the decision making very easy, as long as you act upon it, putting away those things that you no longer need or should not own—to be given away or thrown away, whatever the case may require. This is a valuable exercise because you need to free your time and your energy for greater things. Here you are beginning with the simplest things, the simplest relationships, for you will have greater challenges as you proceed. You are going to need a tremendous amount of energy in the future, and you must gather your resources together. You must gather your strength and build your focus. If your time and life are being spent mindlessly in all directions, you will not have the power to do this, for power here represents concentration. If your life is not focused and concentrated, then your energy is being lost in many different places. Now you must plug up the gaps. Now you must reclaim what is being lost. Now you must gather together all of your strength, for you will need it for the difficult times ahead. You will need it to override and overcome the other influences in your life that are dissuading you and holding you back from doing what you know you must do and from discerning a greater direction that Knowledge within you is attempting to provide for you as you go along. This deep evaluation continues on to greater things: to your work, to your relationships, to your relationship with your body and to your relationship with your mind. Here it is more difficult to bring objectivity because you can identify with these things far more. Identifying with things means that you lose your objectivity regarding them. To review your work, to review your relationships and to review your relationship with your mind and your body, which represents your relationship with yourself, require a very great objectivity. But at the level of Knowledge, the response is fundamental. For example, in your relationships, you must review every one of them to see if they are helping you or hindering you, if the people you are involved with are moving forward in life. In some circumstances, in your employment for example, you may have to work with people regardless, but how you engage with them will make a big difference in the impact they will have upon your life. These are valuable questions. You must gain the strength, the courage and the objectivity to ask them and to act upon them. One person in your life can hold you back and alter the destiny and course of your life. You should never underestimate the power of influence in your relationships. Even if it is a casual friendship, this friendship is either helping you or hindering you in moving forward. As you begin to take steps in moving forward, you will see very soon if this friendship is helping you or hindering you, if the other person is questioning you, belittling you or doubting you in your efforts to focus your life and to prepare yourself for the future. You will need strong companions. You cannot afford to have detractors in your life. You can learn from their challenges, but if you associate with them closely, you will lose ground to them. Here developing strength and discernment will take time and can be very difficult in certain circumstances, for there are people whose approval you think you must have. There are people you are still trying to impress. There are people who you think you need for safety, for security, for love or for pleasure. But at the level of Knowledge, it will be yes or no, for Knowledge is trying to take you somewhere, and everyone and everything in your life is either helping you or hindering you in discovering and following this direction. Your employment either has a future or not in the face of the Great Waves of change. That is something that you can evaluate intellectually. Yet at the level of Knowledge, it is still a yes or a no. Perhaps you will need to stay in this employment for a time, to give you stability while you make other decisions and while you gain a greater certainty about where you must go and the next steps you must follow in your life. But do not overcommit yourself to a situation that has no future, that will not be able to exist in the great difficulties to come. Do not overcommit yourself to anyone or anything until you have fulfilled this deep evaluation. Do not make any great plans. Do not try to rechart the course of your life. Do not commit yourself in marriage or relationship until you have undertaken this deep evaluation over time. Do not give your life away before you know what your life is for and the direction that it must follow. If you will follow this, it will save you. For it is so easy to give your life away to others—to commit yourself to a line of work or to establish a set of circumstances that will prevent you from ever realizing and remembering your greater purpose for coming into the world. People establish relationships casually, using very weak and temporary criteria. They do not realize the seriousness of their engagements and the impact that it has upon them. It is because they lack discernment. It is because they do not value their lives that they would give themselves away so easily and commit their time and energy without greater care, that they would be so careless with themselves. This is a very important part of the deep evaluation. You cannot follow your intellect in this, for there are always good reasons to give yourself to things that will never be valuable to you. There are always compelling reasons to give your life away to people or to circumstances that do not represent your destiny. Then there are social forces that encourage you to marry before you are ready, to have a family before you are ready, to commit yourself to a career before you are ready. All the social forces—the forces from your family and the encouragement from your friends—so often lead you completely in the wrong direction for your life. Do not condemn your family and friends, for they do not know. But you must know. You must gain this Knowledge. And the Knowledge that God has given you makes this possible. Otherwise, you would become lost in the world and would never find your way. Your relationship with your mind and your body represents a very great teaching that the New Message provides. Your mental health and your physical health are important. But to deal with them effectively, you must bring the same objectivity to them. Of course, you identify with your mind and your body, even to the extent that you think that that is who you are. But your mind is not who you are, and your body is not who you are. Instead, they represent vehicles of expression—vehicles through which you can participate in the world, have an influence in the world and express yourself and communicate to others in the world. They are vehicles to take you somewhere, to take you through life in this world, to live at this time, to have an impact upon this time. They are vehicles. Therefore, you must care for them. You must cultivate them, and they must be able to enable you to fulfill your mission in the world. If your health is broken down, either mentally or physically, you will not be able to follow a greater purpose, and in most cases it will never be revealed to you because you are not ready to follow it. Getting your life in order, then, involves also addressing the needs for your health—your mental health and your physical health. The mind requires some structure. It requires enjoyment. It requires companionship. And it requires relief and rest. You are able to discern this through your activities, through the influences you bring into your home, through the media, through your relationships, through the books you read and the things that you think about. Most people have never developed any control over their minds. They are simply the unwitting slaves to whatever their mind wants to think about, and so they feel very helpless in this regard. But in the deep evaluation, which is a process of bringing clarity and objectivity into your life, you are able to gain greater and greater control over your mind and thinking by deciding what you will think about, what you will respond to, what you will listen to, what you will read, what will be in your home, what will be the focus of your activities and so forth. You must gain this control because if you do not control your mind, other people will. If you do not set a real direction in your life, other people will set the direction for you. This, indeed, is the tragic circumstance of most of the people in the world today, whether they be rich or poor. It is obvious that those who are greatly impoverished are slaves to their circumstances. But it is not so obvious that those who are more affluent, and even the very wealthy, are also slaves to their circumstances. Though they have great enjoyments and freedom of time, in the end they are as lost and as deprived as the poorest around them. They will not fare well in facing the Great Waves of change that are coming to the world. They have no advantage. Their wealth can be lost easily, and they will be the target of other people, who will prey upon them. And they will live in great fear and anxiety—afraid to lose what they have and afraid of everyone and everything that they believe can take away from them their pleasures, their freedoms or their opportunities. This is the time, then, to recognize what is needed for your mind and what is needed for your body—very simply. Nothing complex here. If you are following Knowledge, nothing is complex here. You have simple guidelines, and you must adhere to them. At the outset, regarding your deep evaluation, whether it be regarding your possessions, your relationships, your activities or your engagements, it will be important for you to create space in your life to let things go, to open up your life, to allow there to be space in your life without it being filled by something else. In doing so, you will see how much you have tried to gain certainty through your ownership of things, through your relationships, through your engagements and so forth. You will perhaps feel less certain about your life and more vulnerable, but this is a good thing, for this creates a space for a Greater Power to fill and the freedom for you to set a new course, which will bring new people and circumstances into your life. If your life is already filled to the brim, nothing new can come. There can be no new experiences, no new revelations, no new relationships, no new opportunities. So at the outset, the deep evaluation is a process of discernment and release. You are discerning what is really important and releasing that which is not important. You are changing your relationship with things, with people, with places and with engagements. In so doing, you are changing, on a subtle but increasingly powerful level, your relationship with your mind and your body. Here you are gaining strength and learning to become inner-directed rather than merely being outer-directed. 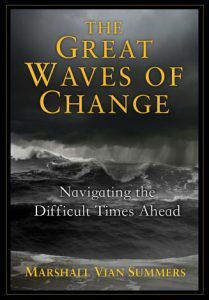 Many people ask, “Well, what shall I do in the face of the Great Waves of change?” Begin with this deep evaluation. That is fundamental. If this is not undertaken, you will not be free to know, you will not be free to act and you will not be free to move with Knowledge. You will be held in place, as if you were chained to a wall—unable to move, unable to reconsider your life and unable to set a new direction. For your life will already have been committed away, given over to others, or just simply lost in the countless thoughts and pursuits that you carry on in the course of your life. You begin with the deep evaluation, and this evaluation continues. It is ongoing because bringing clarity, simplicity and focus to your life is ongoing. You do not do it all at once. It is ongoing. Everything around you wants to encumber you even more with possessions, with people, with places, with opportunities, with distractions, with stimulation and so forth. And so this discernment continues on because you must keep your life open, clear and uncluttered. Your life must be filled with people, places and things that strengthen you, that encourage you and that are symbolic that you have the strength and the responsibility to live fully in the moment and to prepare for the future in a way that is wise and effective. Here you will have to learn to say no to many things: no even to your own mind; no to your compulsions; no to your addictions; no to those pleasures that hurt your mind and your body; no to people who want you to do what they want you to do; no to opportunities that look good, but which, at a deeper level, you cannot accept; no to the consensus of people around you; no you will not follow their advice; no you will not join their group; no you will not accept their perception of reality. You do this not with anger or condemnation, not with fear of rejection, but with simple honesty and simple clarity. Do not be angry that the world is full of deception and full of dishonesty because it is a world without Knowledge. People have not found God’s great gift yet, and so they act foolishly, mimicking one another, following whatever their social conditioning tells them they must follow—following their friends, their groups, their leaders, their religions—everything. For without Knowledge, what else could they do but follow everything that is a substitute for Knowledge? This should not be a source of anger for you if you are seeing it clearly. It is tragic, yes. It is greatly unfortunate, yes. But you cannot afford to be a critic of the world now. Instead of condemning others, condemning the governments, condemning the world, condemning life, you must draw your resources to you. All of that condemnation represents a huge loss of energy, a loss of energy that only adds more friction and complaint to life, without any positive benefit. If your life is not moving with Knowledge, then your position as a critic is pointless and self-defeating. This is part of the conservation of your energy. In the end, the great evaluation returns strength to you, connects you with Knowledge and conserves your energy. Perhaps you do not yet see the value of conserving your energy, for you want every moment of your life to be filled with pleasant stimulation, with meaningful activities, with enjoyable people. You want to fill up the space, but you need to open up the space, allowing it to be empty, holding it in reserve. For it is only in this space that new realizations come to you and that you are able to see things you could not see before, to know things you could not know before, to discern things that were beyond your reach before. New people and new opportunities come into your life because there is a space for them. So, in essence, your life must always have this space and this openness. It should never be filled up. And if it does become filled up, then it is time to let things go once again. Even if your life were completely engaged appropriately, even if you were living The Way of Knowledge, even if every person in your life were meaningful to you and were a proponent of Knowledge within you and for you, you would still have to create an opening—this space in your life where nothing exists, where there is emptiness. It is this emptiness that allows you to be still, allows you to listen, allows you to look, allows you to really be with another person, to really experience a place and to enjoy the magnificence of nature. It is this space, this emptiness, this silence that allow you to discern the signs of the world and the movement of Knowledge within yourself. Instead of trying to fill up the space, you want to create the space and maintain a part of your life as open, unexplained and mysterious. Nothing is going on there. It is this that allows you to have wonder and reverence towards life, to have a pure experience instead of something that simply stimulates your thinking. It creates the opportunity for you to experience yourself outside of time and place—the experience of Grace, the experience of your Unseen Teachers, who are helping you to regain your connection with Knowledge and with it your greater purpose for coming into the world. You can imagine here that if you followed this through, your home would have very few things in it, but everything in it would be very valuable. Your personal life would have very few people in it, but every person would be really valuable. Your time would not be filled up, but would have openings in it for new experiences to happen. And your mind would not be constantly stimulated, but would be able to become quiet, observant and sensitive—seeing, hearing, recognizing things. It is like you are going in the opposite direction from the majority of people around you, who are all about acquiring things for themselves—possessions, people, experiences, sensations, stimulation—to the point where they have no idea who they are. Their life is filled up with external stimulation. They have no sense of where they are in life, where they are going or where the world is going. They are simply being swept away by all of their obsessions. You can imagine, then, as a result of this deep evaluation, that your life becomes simple and clear and that you are able to discern opportunities at a more fundamental level—not whether they are pleasing and exciting, but whether they are truly meaningful and whether they serve your purpose or distract you from it. You will certainly be able to have simple pleasures along the way, but anything that requires a more serious engagement—a new relationship, an important possession, an opportunity in your work, a new interest—these things must really be discerned because the whole world wants you to fill yourself up, while you, in essence, are trying to empty yourself out. This is why you must have very limited exposure to the media, only looking for those things that are important regarding the Great Waves of change or in some cases that are important in your immediate circumstances and environment. You should not be stimulated by the world. You are going to have to maintain some distance now if you are ever to have a hope of gaining your strength, building your discernment, cultivating your discretion and learning to become really observant—really being able to see what you need to see in yourself and in others. You cannot do this if you are running around like a crazy person—driven by your needs and desires and obligations to others. That is why the deep evaluation must happen at the outset if you are to have any chance of success. And this evaluation will continue, for there are thresholds that you must evaluate for yourself. Part of this you will undertake on your own, and part of it will be assisted by other people. The quality of your relationships now will become ever more important to you as you recognize that each relationship is significant in its influence upon you—whether it supports the emergence of Knowledge within you or whether it distracts you from this emergence, whether it encourages your preparation for the Great Waves of change or whether it discourages this preparation. Your relationships here are of the greatest importance, and this importance will grow over time. As you proceed, then, your life will have greater resources of energy. You will be able to undertake significant change in your life—change that you could not undertake before because you did not have the strength to do it. You did not have the potency within yourself to carry it through. Before, you saw things you knew you needed to do, but you did not have the strength to do them. You could not override your own mind or the opinions of others. You were just not strong enough to do it. Now you can do it, and it is giving your life greater flow and greater movement. Can you imagine that everything in your life represents your greater purpose in the world, the greater meaning of your life and that this has given you enough strength that you can deal with adversity now? It does not defeat you. You can deal with others disagreeing with you or criticizing you without losing yourself to their viewpoints. This is a source of fulfillment and joy in your life. It is like you have been reclaimed. You have reclaimed yourself, and you have allowed others to come into your life who support that reclamation, which is fundamentally the reclamation of Knowledge. Along the way, you have gained skills that you can now use to assist others, for they too must begin the deep evaluation. They too must learn how to gain their own strength and to reclaim their lives, which had been given away before without thought or consideration. The tools that you gain, the strength that you gain, the skills that you employ all become resources for assisting others in the future, and you will do this naturally, spontaneously. Even your life will be a demonstration of this, which will inspire and confuse other people. The truth is you are not where you need to be in life, and you know this, and that is why you are uncomfortable. Do not try to get rid of the discomfort, for it is a sign within you that your life must move, that there is change that must be brought about, and that you must do it. Allow yourself to be with the discomfort. Feel it. See what it is telling you. See where it is taking you. Where are the points of discomfort? Where is the lie being lived in your life? What are the mistruths you are telling yourself about your relationship with this person, this place or this thing? You will have to overcome tendencies within yourself, habits within yourself and the other voices that the world around you has put in your mind, telling you that you want things you really do not want, or that you must have things to be attractive or to be successful. This is a very great process. The truth remains that you are not where you need to be. Do not ever tell yourself you are just where you need to be. That is foolishness. You will never convince Knowledge within yourself. You have a great mountain to climb, and you must keep moving up this mountain to fulfill your destiny and to gain a vision of the world, which will become obvious to you once you reach the higher altitudes of this mountain. Whatever you tell yourself, you cannot convince Knowledge within yourself. You need to get to where you need to be—to be in the best position for the future, to reclaim your strength, your skills and your greater gifts and to be of service to a world whose needs will only grow and become more profound in the future.